One of my current projects; A 1:12th scale miniature Michael Jackson doll. Back in 2010 I started working on my first ever 'portrait sculpt'. It was Michael Jackson inspired by the music video for 'black or white' which is on my top 3 of MJ songs (1st; They don't care about us, 2nd; Smooth Criminal). I chose that outfit because I'm not particularly fond of the outfits in either of the 2 versions of 'they don't care about us' and though I love the iconic white suit from 'Smooth criminal', the tilted hat simply covers up too much of his face - what's the point of sculpting someone if you can't see them?.. And well, I really love the outfit from 'Black or white'. It was approx 1:6th scale.. I never finished it and I threw it out a long time ago. I've looked on every computer, harddisk and old blog for the pictures I had of it, but unfortunately, seeing as I never finished it, I had chosen to delete those as well. Would have loved putting them side by side with the new sculpt. 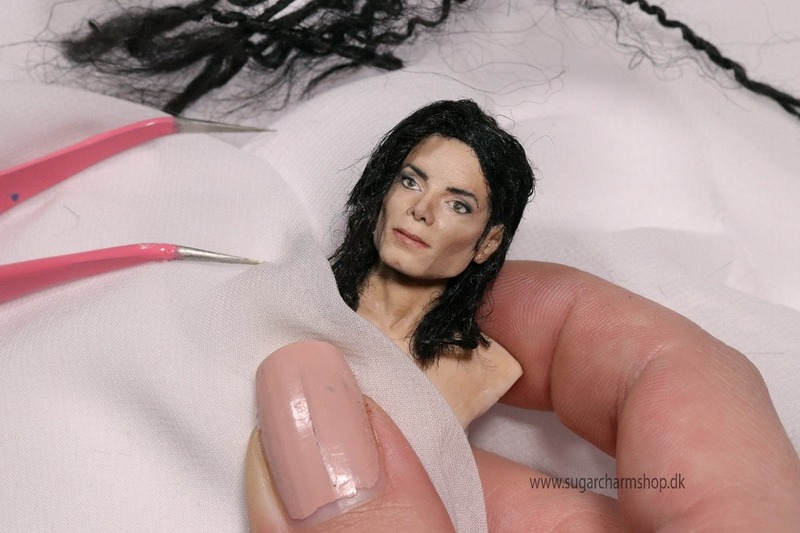 I wasn't supposed to start working on a miniature doll right now - especially not one like this, which likely will be more difficult to sell (Michael Jackson tends to not be the most frequently used character in dollhouses), but when inspiration strikes,.... I really enjoy making dolls - I just have a tendency to not finish them (sculpting and decorating the head is the most fun part to me) and as a result, I don't start working on a lot of new dolls. It's weird,. When I make anonymous dolls (dolls that aren't meant to be anyone specific) I tend to always make girls/women - I just enjoy that a lot more because, well, who are we kidding? ; women are the best ;) But when it comes to portrait dolls I'm generally only inspired to sculpt men. It's not that I don't like any of the women out there, they're just not the ones that pop up in my head like *KAPOW INSPIRATION!*... Not counting one danish acress 'Kirsten Walther' as I'll probably never make her, I do have 1 little lady on my list of 'to be considered'; Betty White,. no explanation needed, right? - Xacto knife; for cutting the clay into shapes before applying it to the face and for cutting away small sections and details. - Pointed dotting tool/embossing tool; an embossing tool with a fine/pointed end. (I've used files to shape the other end to a slightly finer point) - One of my most used tool for adding shape to under the eyes, around the nose etc. - Silicone tool; from an art shop (Can be found super cheap online as well, but the quality of the silicone as well as the amount of give it has varies). The second one of my most used tools - perfect for adding shape all over as well as smoothing out clay much more neatly than what can be achieved with the embossing tool. The shape is also perfect for cheekbones and other types of 'bone structure'. - Needle tools. I often work with 2 needle tools. One is super fine and the other is slightly less pointed/sharp. They're great for all the tiny details and fine lines.